Plants very small, in green, yellow- or gray-green, often silky mats. Stems sparsely and irregularly branched, branches terete-foliate, often erect-ascending, often sub-julaceous, radiculose in scattered tufts. Leaves ovate to oblong-lanceolate, rarely lanceolate, subulate to piliferous, rarely blunt, often somewhat concave; margins plane, denticulate, dentate, or ciliate-dentate, rarely entire; apices acute, acuminate, or long-acuminate; costa single, 1/3--2/3 leaf length, sometimes ending in a small spine; basal cells rounded-rhomboidal to rhomboidal, quadrate to transverse-rectangular in a few rows along margins; alar cells quadrate in several rows; medial and distal laminal cells rhombic, rhomboidal, or elongate-rhombic, 30--45 x 9--12 \um, smooth; apical cells linear. Specialized asexual reproduction apparently by foliose pseudoparaphyllia. Sexual condition autoicous. Seta single, erect, yellowish, smooth. Capsule 0.35--1 mm, often flaring at the mouth with aging, neck short, wrinkled when old; exothecial cells more or less isodiametric, walls sinuose, suboral cells transverse-elongate, angular, with straight walls; stomata present in neck; annulus absent; operculum conic, umbonate to mammillate; peristome single, rarely absent, incurved when moist, erect-spreading, sometimes recurved when dry, of 16 teeth usually fused in pairs, broad-lanceolate, blunt, to 0.36 mm, red-brown, densely papillose-striolate. Calyptra cucullate. Spores 10--16 \um, coarsely papillose or smooth. Genera 5, species ca. 17 (1 genus, 2 species in the flora): North America, Mexico, West Indies, Central America, South America, Eurasia, Africa, Atlantic Islands, Pacific Islands (Hawaii), Australia. Stems prostrate. Leaves loosely appressed when dry, spreading when moist. Capsule ovoid to pyriform. Species ca. 11 (2 in the flora): North America, Mexico, West Indies, Central America, South America, Eurasia, Africa, Atlantic Islands, Pacific Islands (Hawaii), Australia. Fabronia is characterized by its very small size, ovate to oblong-lanceolate, long-acuminate, usually toothed leaves tipped with linear cells, rhomboidal laminal cells, and relatively short costa. 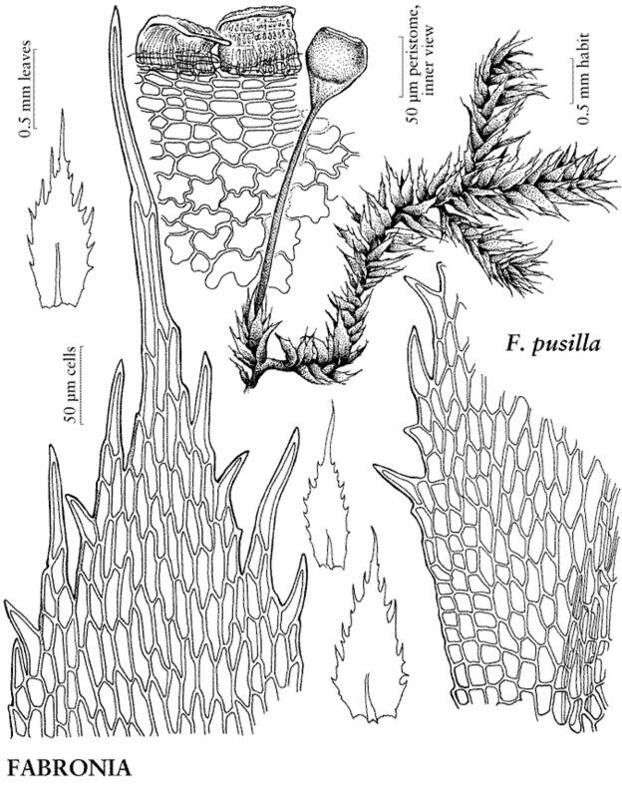 However, because of the wide degree of morphological variability, especially within the F. ciliaris complex, Fabronia is taxonomically difficult. Discussions of Fabronia by H. A. Crum and L. E. Anderson (1981) and W. R. Buck. (1994) are enlightening with respect to the problems facing its taxonomy. Buck, W. R. 1994. Fabroniaceae. In: A. J. Sharp, H. A. Crum, and P.M. Eckel. 1994. The Moss Flora of Mexico. Mem. New York Bot. Gard. 69. 2 Vols. New York, pp. 860--867. Crum, H. A. and L. E. Anderson. 1981. Mosses of Eastern North America. Vol. 1. New York. Leaves 0.4--0.94 mm; margins dentate, teeth of one cell, sometimes entire; apices acute or acuminate; medial laminal cells 30--45 x 11--12 \um. Capsule 0.5--0.8 mm; peristome to 0.36 mm. Spores 9--14 \um. Capsules mature summer. Bark of trees and on rock; low to high elevations; Ariz., Ark., Calif., Colo., Ga., Ind., Kans., Ky., La., Mich., Minn., Mo., N.J., N. Mex., N.C., Ohio, Okla., Oreg., Pa., S.C., S.Dak., Tenn., Tex., Va., Wis.; Mex. ; West Indies; Central America (Guatemala); South America; Europe; Pacific Islands (Hawaii, Japan, New Zealand); Australia. This treatment of Fabronia ciliaris generally follows that of W. R. Buck (1994) although the varieties delimited there for F. ciliaris are not applied here though the varietal keys and associated discussions there are very useful. That work underlines the high degree of morphological variability within this species. Although many species and varieties have been described within the concept of F. ciliaris, examination of the variation between and within populations, especially with respect to the degree of leaf margin dentition, does not support the acceptance of most of these taxa. Few of the specimens that were examined could readily be sorted into any of the three varieties recognized by Buck, and the identification on a herbarium packet was often not consistent with the characters exhibited by the specimens within the packet. Thus, it appears that the interpretation of species or varieties remains subjective. Leaves 0.4--0.85 mm; margins ciliate-dentate, teeth often of more than one cell; apices acute to long-acuminate; medial laminal cells 30--45 X 9--12 \um. Capsule 0.5--0.8 mm; peristome to 0.36 mm. Spores 9--14 \um. Capsules mature late spring--summer. Rock. bark at bases of trees; low to high elevations; B.C., Ariz., Calif., Colo., Idaho, Oreg., Wash.; Mexico (Baja California Sur); Europe, n Africa. Fabronia pusilla is a tiny but beautiful moss, unmistakable because of the long-acuminate and ciliate-dentate leaves.